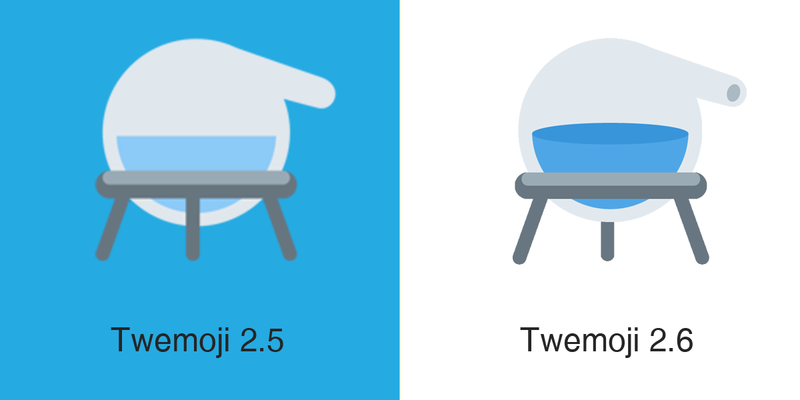 Roughly two months since making a series of small design changes via its Twemoji 2.5 update, Twitter has today begun the rollout of Twemoji 2.6. Akin to the latest release, this update features no new emojis: Twitter has been fully up-to-date with Emoji 5.0, the latest emojis to be fully sanctioned by the Unicode Consortium, since May of 2017. 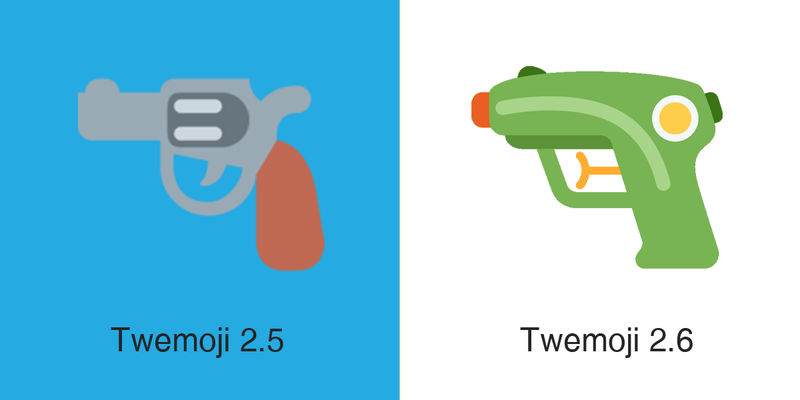 Yes, Twitter has altered its 🔫 Pistol emoji design away from a realistic revolver towards that of a plastic squirt gun. This update echoes the change made by Apple in 2016, which has since been followed by WhatsApp and, more recently, Samsung. It certainly seems like the days of realistic gun emoji designs are numbered, and it's quite likely that other vendors may follow suit in the near future. Maybe 2018 will indeed be the year of emoji convergence. 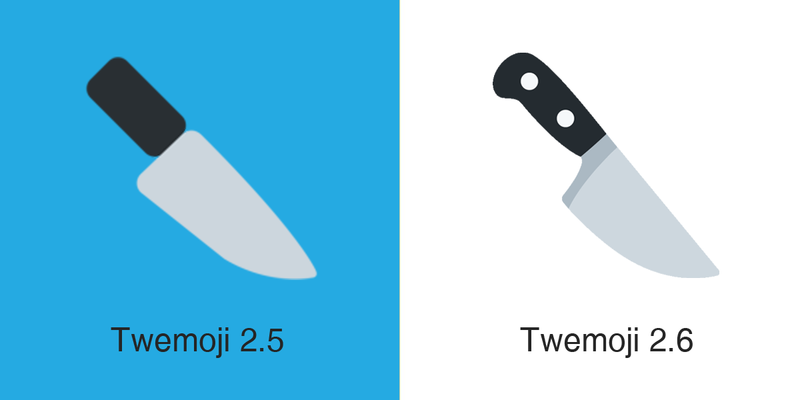 While significantly less dramatic than the gun, the 🔪 Kitchen Knife has also received some notable modifications. The blade is now more curved and features a dark grey bolster at the top of the handle. The handle itself has also been curved and now featured two metal rivets. Overall this results in the blade looking more clearly like a chef's knife. Next, the 🔮 Crystal Ball has had its stand modified to have triangular curvature and no longer obscure the bottom of the violet glass sphere. The water within the ⚗️ Alembic is slightly darker and features an additional shade on its surface. The centre leg of the metal frame is also shown as being behind the glass, as opposed to in front of it, with the frame also darkened. There is also a small grey opening featured at the end of the glass vessel's downward pointing neck. 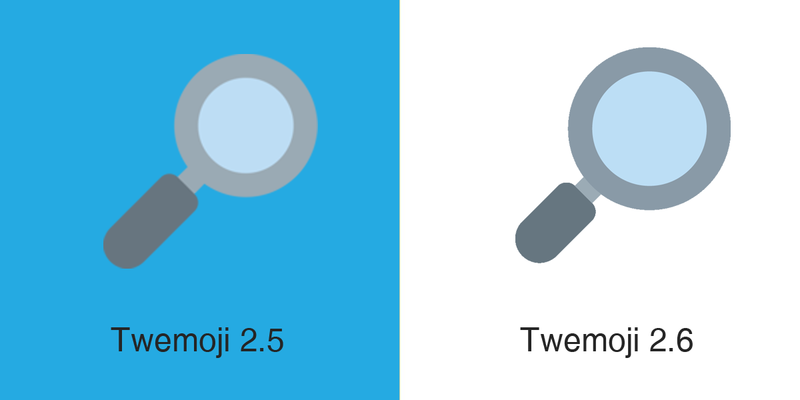 The remaining changes within Twemoji 2.6 are even more minute. The 🧥 Coat has a reduced number of creases across its arms and torso, while the oval curves of the 👀 Eyes are very slightly more rounded than before. Finally, both the 😈 Smiling Face With Horns and the 👿 Angry Face With Horns have had their purple skin tones changed to the same shade used for the 🔮 Crystal Ball. 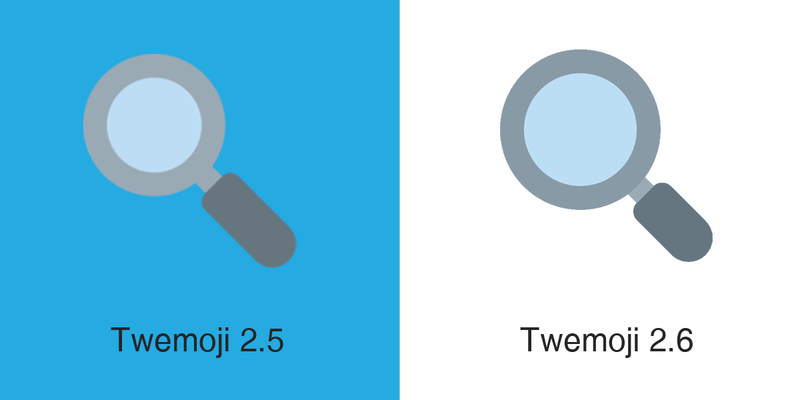 Twemoji 2.6 has begun rolling today. It will be available for all users of the Twitter website, Twitter mobile site, and Tweetdeck. 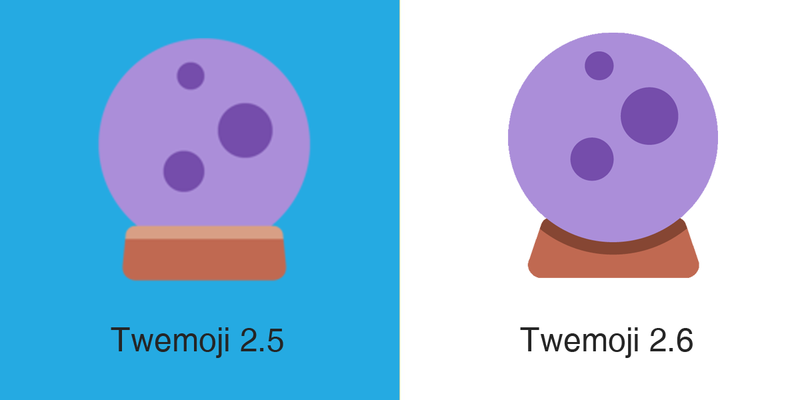 As always, these updates are expected to appear within the Twemoji Open Source project shortly.